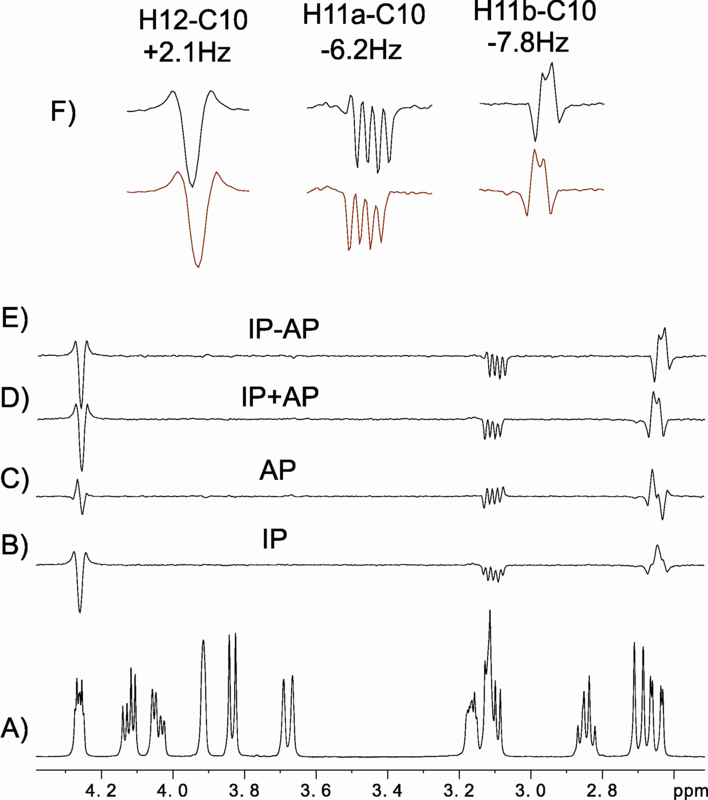 The C-HA cross-peak corresponding to a diastereotopic CHAHB methylene spin system exhibits a characteristic 1:0:1 multiplet pattern along the indirect dimension of a ω1-coupled HSQC spectrum. It is shown here that the use of the initial 13C Boltzmann polarization instead of the regular INEPT-based 1H Boltzmann polarization makes visible the central lines of this multiplet pattern. A spin-state-selective method is proposed for the efficient measurement of both 1J(CHA) and 1J(CHB) along the indirect dimension of a 2D spectrum as well as to the magnitude and the sign of the geminal 2J(HAHB) coupling constant from the straightforward analysis of a single four-component E.COSY cross-peak. 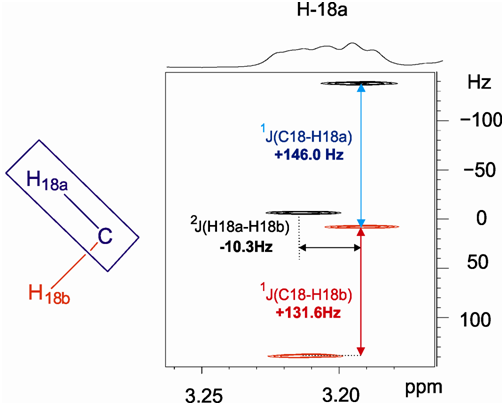 Additionally, the extraction of1J(CH) values for CH and CH3 multiplicities can be also performed from the same spectrum. The success of the method is also illustrated for the determination of residual dipolar 1D(CH) and 2D(HH) coupling constants in a small molecule weakly aligned in a PMMA swollen gel. © 2014 – 2017, Josep. All rights reserved by the author(s) and Universitat Autonoma de Barcelona except for texts and images already copyrighted by third parties (e.g. journal publishers) and used here under the fair use provision.